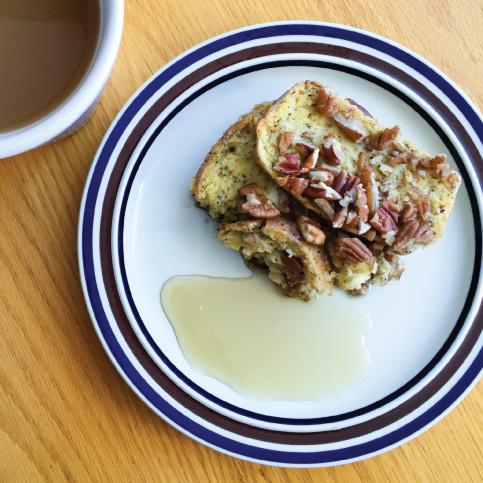 A delicious make-ahead French toast casserole recipe from Team SRSLY runner Katie Matthews. Prepare the ingredients the night before, then toss the casserole in the oven in the morning for a simple breakfast or brunch that won't disappoint. In a small bowl, combine melted butter and brown sugar. Pour into the bottom of a 9x13 baking dish. Arrange slices of bread in the baking dish in two layers. Wrap tightly with plastic wrap and place in the refrigerator for 4-12 hours. Remove the baking dish from the refrigerator and let sit on the counter for around 10 minutes while preheating the oven to 350°F. Bake for 30-35 minutes. If the top starts browning too quickly, cover loosely with aluminum foil for the last 10 minutes or so of cooking. Once the top is golden, remove from oven and let cool slightly before serving. Slice into pieces, and serve with maple syrup and/or powdered sugar, if desired.